Sometimes you just need a little something sweet. 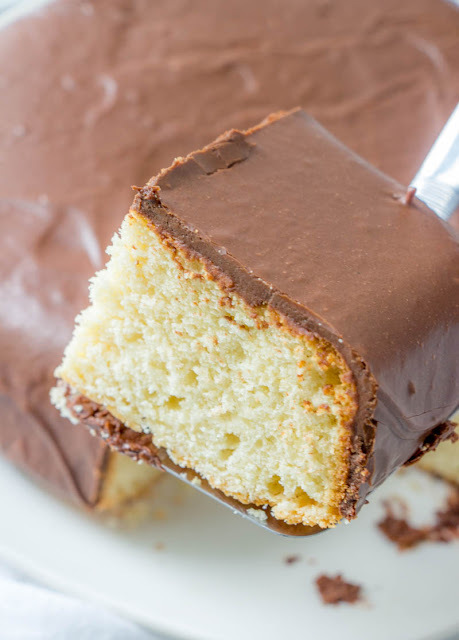 This simple cake is creamy and delicious and the frosting is fudgy and delicious. 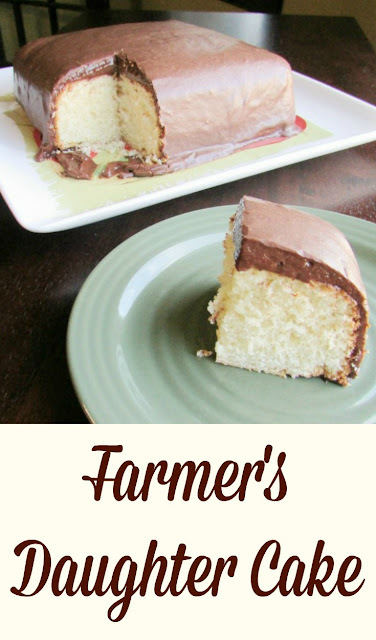 This Farmer's Daughter Cake is a must make treat! 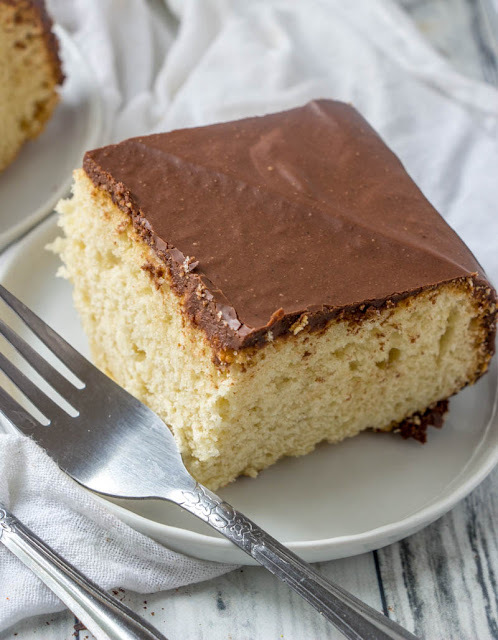 This recipe for Farmer's Daughter Cake has had a life of it's own ever since I posted it in September of 2016. So I figured it was high time I updated the pictures and added video to it. 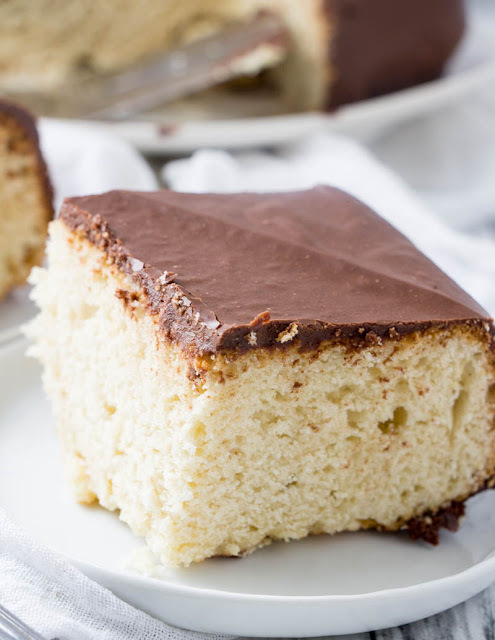 This simple cake is great because it makes a nice small square cake. Plus there's the fudgy frosting! Of course that gets my attention every time! Now I'll let you go back to the original post, I hope you enjoy the new pictures! It is finally time to share this cake! I actually made it in July thinking I was really ahead of the game getting August's Cake Slice post done so early. They I realized I had looked at September's list instead of August... so I was even more ahead than I thought! I used to be the queen of writing a paper the morning it was due. If only my college professors could see me now! All four choices sounded delicious as always this month. But this one definitely stood out for a couple of reasons. The first being I had all of the ingredients on hand. That is always one of the most important factors, so that one alone would have probably been enough! The second was that it made a small single layer square cake. The third intriguing part of this cake is that instead of using oil or butter, Maida uses cream. And last but not least, this cake had a fun chocolate frosting and we all know that as far as I am concerned it is the frosting that makes the cake. I don't actually have a square cake pan. It's hard to believe, I know. But I did have a glass square pan. Had this cake been a layered cake, the hard edges would have been more important. But I figured in this case with one layer and a more rustic feel to start with the rounded edges of the casserole pan would work fine. In the end I actually liked the rounded look, but again would not recommend using a pan like this if I were stacking. The frosting can be a little hard to deal with. Maida made it clear that you had to pour very slowly or you'd end up with a cake in a pool of frosting. She wasn't kidding! The first time I made the cake, I thought I was working slowly enough and the next thing I knew there was frosting pooled around the cake. Luckily I had rimmed the cake with wax paper strips. I just spooned a bit of the frosting at a time back onto the cake until it mostly stayed put. Other than that, I really liked the frosting. It did form a skin as time went on and the cake traveled fine to dinner. But when you cut into the cake, the inside of the frosting was still super soft and moist. It was almost like a thick chocolate pudding. It went really well with the cake. As you can see though, if you let the frosting cool completely, it actually works quite nicely. Just check out the video to see how easy it can be! We all enjoyed a slice after dinner and a few even went back for seconds right away, which is always a good sign! Luckily my in-laws were happy to keep the rest of the cake, which was especially good as I had made a couple of cakes that weekend. This is definitely a cake that would be worth making again! It has been a lot of fun baking our way through Maida Heatter's Cakes with the Cake Slice Bakers. I have had good luck with most everything I've made and I have really enjoyed seeing everyone else's bakes as well. It won't be long and we'll be starting our new book. I can't wait to dive in! If you are a frosting fanatic like me, check out my Frosting 101. It goes through the different types of frosting and links to all sorts of delicious recipes! In a separate bowl, or your mixer, beat together the eggs, vanilla & almond extracts and sugar until combined. Add the cream and mix until incorporated. Stir in the dry ingredients, beating just until smooth. Pour into prepared pan and smooth out the top. Let cool for 5 minutes before inverting onto a rack to cool completely. Once cool, place upside down on a cake plate so that you have a flat surface on top. In a heavy bottomed sauce pan, stir together milk and sugar. Add chocolate and heat over medium heat until sugar is dissolved and chocolate is melted. Be sure to stir frequently as you go. Remove from heat. In a small bowl, whisk egg yolks just enough to break them up. Gently temper with a bit of warm chocolate mixture. (I added a few Tablespoons of chocolate mixture and beat vigorously then repeat the process to temper the yolks and keep them from scrambling in the hot chocolate mixture.) Then add egg yolks to the remaining chocolate mixture, beating to combine. Transfer chocolate mixture to the bowl of your mixer and stir in the butter and vanilla. Let stand until cool. This may take a while, but I put mine in the refrigerator for a bit to hasten the process. Beat the icing at high speed for 10-15 minutes. It should be smooth, shiny and about the consistency of corn syrup. Be sure to place wax paper strips under you cake as this icing can get messy if you are like me and are short on patience! Pour about half of the icing on the cake and then step back for a minute or so. Then continue to pour the icing just a bit at a time onto the center of the cake. If you poor too quickly, all of the frosting will run down the sides. Gently coax the frosting with a spatula if it needs help going in a certain direction. If you went slowly enough, the frosting should have stayed mostly in place. If not, just scoop the large puddles off the wax paper and place back on the center of the cake until most of the frosting is on the cake. Carefully remove wax paper strips. Let the cake sit for a couple of hours so the icing sets. You should follow along on Pinterest as well! And now to see what everyone else baked! Looks delicious and I had to smile because my own dad made a cake very similar to this but he wasn't a farmer, lol. It really is perfect for taking along! I love doing the layer cakes, but by the time you put them on a pedestal plate they are nearly impossible to travel with unless you have a willing husband to hold it! Hi Carlee, I love the look and sound of this cake. The slight roundness works, making it look more attractive (I think). I find it interesting that the fat in the cake is just thick cream, which must make it nice and moist. This is a cake I will be trying for sure! Thank you, Debbie! Isn't it cool that the cream provides the fat? Plus it is so easy to put together. I hope you enjoy it! Carlee -- my favorite kind of cake - white/yellow with chocolate frosting - yummy and your picture makes it look so good too - I am going to get my daughter to make this recipe for me - she loves to bake and try new things and I like that it's called the farmers daughter cake - cause when I think of farming, I always think of rich and delicious home baked goodness. thanks for sharing at #WayWow where I found you. That's usually my favorite cake combination too, Debbie! I hope you both enjoy it. It is a fun one to make and of course even better to eat! This would be my mom's (and mine) favorite type of weekday cake. If the frosting flowed onto the plate I'd have to clean that up before serving. Oh darn!! Looks good enough to eat, Carlee. It's a shame when you have to help clean up that extra frosting, isn't it? ;-) Thanks so much, Linda! I made this. Everybody loved it. My granddaughter ate the frosting with a spoon. Thanks, Cathy! It was a fun one, that is for sure! I love the portion too! Sometimes it's nice to have just a bit of cake rather than a monster! Thanks, Michelle! Mmm...looks so simple and delicious! Thank you for joining the Creative K Kids' Tasty Tuesday, I can't wait to see what you come up with next week. You have to love a cake you can just stir together real quickly! Thank you! It turned out great Carlee! You have me craving this cake again, time to get it on the menu! It's definitely worth making again, don't you think? We really enjoyed it! This looks so delicious! That frosting - YUM! Isn't that something?! It was definitely a fun frosting to try! Yummy cake! It looks light and fluffy, would love to try it! It really is good and so simple to make! You should definitely give it a go! Glad that you made the frosting.It sounded like a great one, but difficult. Your cake looks wonderful! It was kind of fun. A bit of a mess (probably because I have the patience of a toddler sometimes) but really delicious and it turned out with a really fun texture! Your cake turned out perfectly. I love how the frosting looks. It's really awesome when everyone likes it. I like the way your frosting look on your cake, and good to know that the cake took to travelling well! Happy that some at your get together went for seconds! I love it when people go back for another round! The frosting had such a fun consistency, I think I'll have to make it again soon! Carlee, once again I have not eaten breakfast and I'm looking at this cake wanting to pull it off the screen! I love pour over frosting, I do that with my bundt cakes and brownies, but I have been lazy and just warmed the frosting I buy from the store. I know that this is not the most healthy way to do frosting. I will be using your recipe from here on out, this way I know what we are eating! Thanks for sharing! You are the best! It's dangerous to go looking at food posts before breakfast (or really any time of day in my case!) 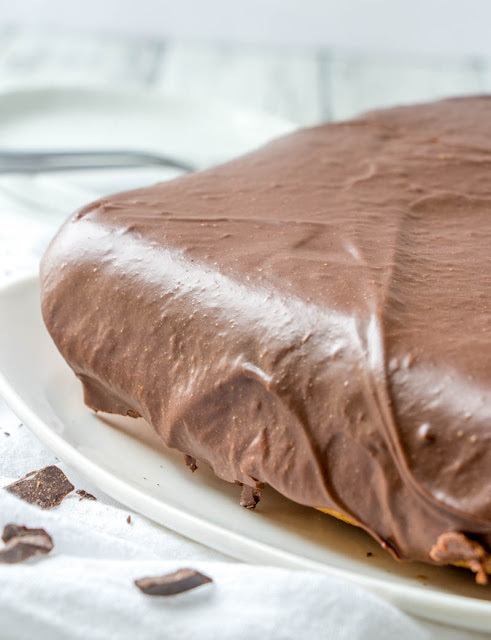 I have really loved getting introduced to so many new frosting ideas through this group. I know we are both frosting girls at heart, but I am learning how limited my repertoire was before. I am loving this broadened and dangerous world I'm living in now ;-) I love the ease of a pour over and the smooth finish, so this was a fun one! I found the frosting a bit finicky as well. I after pouring just a bit on top I stick the bowl in the freezer for 10 minutes. It was much easier to work with after that! I bet it was a lot easier after a trip to the freezer! I kind of had fun playing with it, but having it a bit more set would have helped a lot! This cake looks awesome! Thanks for linkin' up with What's Cookin' Wednesday! I love this cake, Carlee! 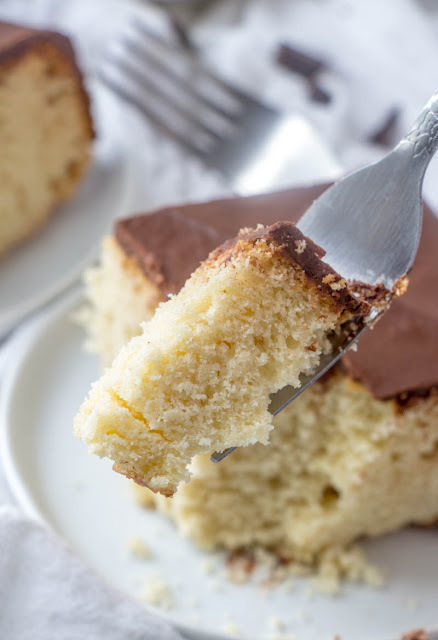 It's so nice not to have a huge cake - but to have a couple fun ones just to whip up for a weekday or a simple party...we used to call them snack cakes and back in the day, no one had special pans. We all used our 8 x 8 casserole dishes! I think it's charming! Thanks, Mollie! I kind of thought so too. I need to look into more snack cakes. It was fun to be able to just stir it together and have it be ready in no time with no real effort! Thank you so much! It is a fun one, especially when you don't need a huge cake! I used to be the queen of writing fast papers too! I was never much of a "spend multiple days on a long paper" kind of girl 😁 And that frosting? I was sold at "thick chocolate pudding"! I always did much better if the deadline was looming and I could just sit and follow one thought all the way through. I tried to do a bit at a time a couple of times, but I always end up just starting from scratch and powering through at the last minute anyway! The style suited me just fine ;-) Isn't that frosting kind of dreamy? Oh, that frosting!!! This recipe looks mouth watering good! Pinned and sharing. Thanks for linking up at Family Joy Blog Link-Up Party this week. Isn't it amazing? So different than the buttercreams and cream cheese frostings I am used to! Thank you! Thank you so much, Marsha! I always love visiting your potluck! I have had a square pan on my list for years!!!!! They are nothing unusual and I come across them all the time! Why can't I just simply buy one?! Ugh! The reason why I didn't make this cake! I would love one too. I don't know why I find it so hard to pull the trigger on something like that. It isn't even like they are all that expensive. I think the casserole pan worked just fine for this cake though, in fact I kind of like the way it turned out! Your recipe is featured this week at Full Plate Thursday. Hope you enjoy your new Red Plate and have a fantastic weekend! Your cake looks so delicious, and the crumb looks both light and moist. I can see why this cake was such a popular choice in the group. I was surprised how many of us chose it, but it was definitely a winner in my book! I love it when the group ends up baking all 4 choices! This cake sounds so good. I love almond an chocolate together! Sounds like it was a hit with the in laws and that’s always a good thing. It never hurts to get a few brownie points from the in-laws! I need to make this one again soon! Made this cake today. It was done in 29 minutes rather than the 35-40. The only thing about making it is it isn’t difficult, just time consuming due to the cooling the frosting and then beating for 10-15 more minutes. Everything went really well, looked great and the frosting presented no problem. The frosting is absolutely wonderful. Cake was very dry. I was so disappointed in that. It is a great size as it’s just my husband and me. I went back over the recipe and didn’t see anything I missed. Any suggestions? I wish they would too! The comments are really helpful for improvement. The only thing I can think of is different measuring style when measuring the flour. The recipe itself was taken from Maida Heatter who was known as the queen of cakes. My only tip would be, I always like to stir in a Tablespoon or two or yogurt or sour cream into my cakes where it makes sense. That may help here as well. Thanks for the feedback! 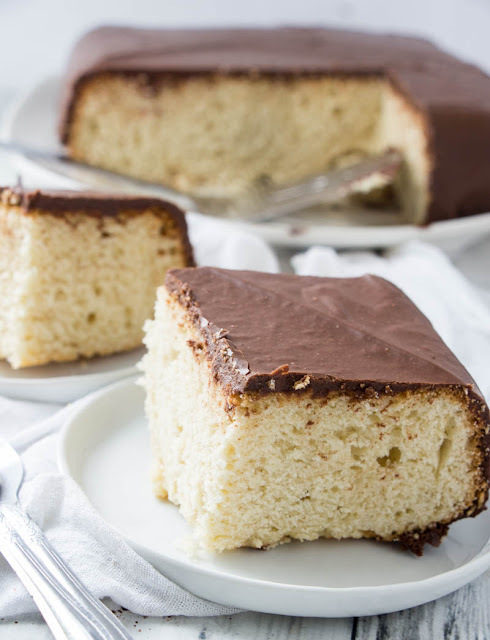 I really want to reach in with my fork and take a big bite of this gorgeous cake! I made it a feature at the Whimsical Wednesdays Link Party this week. Thank you so much for sharing it with us! Help yourself to a bite! Thank you! I hope you love it! It has to be hard being away from your own pans. A round pan will work great as well. Love this cake! Cannot wait to make it! My favorite kind of cake. Chocolate frosting is the best!